Preliminary journeys in Macedonia have shown that local conditions are exceptionally favourable to more systematic work; and it has been decided to form a committee of Oxford and Cambridge scholars to conduct research in the history, archaeology, and anthropology of these Balkan lands. Macedonia, as well as Thrace, has hitherto has been a terra incognita, though afford a most promising field for research in prehistoric, classical, Byzantine, and medieval archaeology. 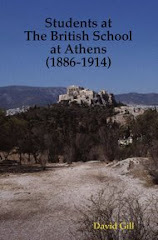 Alan J.B. Wace and Maurice S. Thompson had just completed their research in Thessaly and were engaged for the work in Macedonia. The outbreak of the First Balkan War in October 1912 (and the capture of Salonica in November) disrupted further work. As war broke out throughout Europe Wace explored the possibility of excavating at Olynthos (though this was in fact conducted by the American D.M. Robinson after the First World War). The trench warfare in Macedonia brought to light numerous archaeologial sites and the British School conducted further excavations during the 1920s. Casson, S., and E. A. Gardner. 1918/19. "Macedonia. II. Antiquities found in the British Zone, 1915-1919." Annual of the British School at Athens 23: 10-43, pls. i-xiii. Heurtley, W. A. 1939. Prehistoric Macedonia: an archaeological reconnaissance of Greek Macedonia (west of the Struma) in the Neolithic, Bronze, and early Iron ages. Cambridge: Cambridge University Press. Wace, A. J. B. 1914/16. "The site of Olynthus." 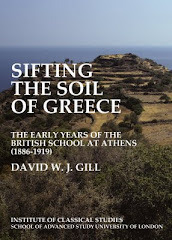 Annual of the British School at Athens 21: 11-15. Wace, A. J. B., and M. S. Thompson. 1911. "The Distribution of Early Civilization in Northern Greece." Geographical Journal 37: 631-36. Wace, A. J. B., and A. M. Woodward. 1911/12. "Inscriptions from Upper Macedonia." Annual of the British School at Athens 18: 166-88. Woodward, A. M. 1911/12. "Inscriptions from Beroea in Macedonia." 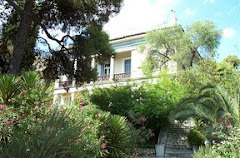 Annual of the British School at Athens 18: 133-65.